Today, numerous technologies and innovations are on the brink of making significant differences in our modern society. Oodles Blockchain strives to leverage the technologies and inventions that contain the potential to turn visions into reality. Technologies that are yet to be widespread but already showing signs of reaching the next level. The Blockchain is the most discussed technology in the recent decade. Blockchain, an application of distributed ledger technology (DLT), is an unchangeable, distributed (write once and read-only) ledger used to record digital transaction shared peer-to-peer between different parties within the network. The core strengths of its ecosystem are networked immutability and data uprightness. Compliance When Blockchain is the underlying technology, application development on top of a platform allegedly conform to many privacy and regulatory compliances. Why Blockchain for Enterprise Application Development? Users of blockchain based applications can share whatever information with anyone they want with no data corruption or tampering worries, as Blockchain is immutable and distributed. As a user, you can oversee, along with allowing access, how they are using your data. You can specifically authorize any particular personnel or organization to access your information. Built on the top of the Spring framework, Spring Boot facilitates easier configuration of production-grade Java-based Applications. Numerous reasons signify why Java with Spring Boot is one of the most preferred programming languages for developing blockchain based application and blockchain app development services. Compliance According to the Open Web Application Security Project (OWASP), there are a few critical security perils need to be taken into account for the secure development of a web or mobile app. JAAS: It’s a security API, having a set of Java packages, especially intended for user authorization and authentication. Spring Security: It’s a customizable framework used to deal with access control (authorization) and authentication complications in the enterprise applications written in Java. OACC: It’s an application security framework. It’s designed for access control involving great attention to detail (object level). Why Java for Blockchain Application Development? Java, designed to use as few implementation dependencies as possible, is an easy and scalable programming language for efficient web app development. It allows coders to write the code once and use it anywhere for achieving cross-platform portability. Java also utilizes memory management which helps in better administration of the effectiveness and speed of the web application. Subsequently, it provides multi-threading for quick response time, lesser glitches, various operations, and high-grade performance. A branch of AI, Machine Learning is the concept of providing machines with access to data and allowing them to learn for themselves. Compliance Cognitive resources like AI and ML are successfully turning science fiction into real-world solutions. 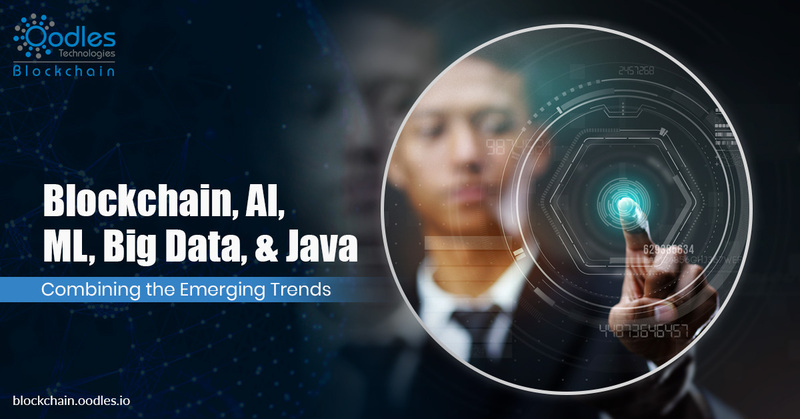 However, developers working on cognitive tech to develop into software must keep an eye to security risks to data along with being conformed to privacy and data regulatory compliances. Engaging counsel to ensure appropriate addressing of contractual arrangements with sources of the data. Why AI and ML for Blockchain Development Services? AI significantly reduces time consumption to perform a task by enabling multitasking and reducing the workload for existing resources. AI offers the following benefits to innovators like Oodles Blockchain and other technology service providers all around the world. Data analytics is the concept of examining, purifying, transforming, and modeling data with to extract relevant information, notify consequences and encourage decision-making. Compliance It’s crucial that companies implement necessary security solutions to satisfy various compliance mandates, such as the Data Protection Directive, Data Protection Act (DPA), Quality Improvement Act (PSQIA), and HITECH Act. Advantages of Data Analytics Big data analytics in numerous industries like healthcare, fin-tech, real estate, etc. has potential in abundance. Not only can it enhance IT effectiveness and efficiency but also help us optimize several clinical methods. Why Data Analytics in Blockchain Application Development Ecosystem? Data Analytics, or simply Big Data, can discover demographic groups and enable us to make decisions for optimized outcomes.